There has been such a great response to our Children’s Christmas Program this year, we have decided to hold an encore performance in the near future (our initial date was cancelled due to bad weather). Stay tuned for the new date. This year’s program is entitled “Star of Wonder”. Shining stars from Zion’s Youth Group and children’s choir will be taking the stage to help remind us of the true meaning of Christmas. The offering collected at the program will go to help needy families in our community. The Christmas Cantata will be presented at the Christmas Eve worship service on Friday, December 24th at 7:00 pm. Practice will be held every Wednesday night at 7:00p.m. If you would like to sing in the Cantata contact Dana Lee Smith, director, at 728-3227 or 655-1377. Can you believe Christmas is almost here? The children are excited about their parts in the upcoming performance of “Star of Wonder” on Sunday, December 12th at 6:30 pm. The children will need to arrive at 4:00 pm for a short practice and pizza. We will costume the children at 5:00 pm. Please note the remaining practice times and dates: Sunday, Dec. 5th , 12:15p.m. & FINAL REHEARSAL (DRESS) Saturday, Dec. 11th, time to be announced. Also, they will sing at the Friday, Christmas Eve Service at 7:00 pm. It is important that they attend the practices that are left and the Christmas Eve Service. We will practice on December 15th and have a Christmas party. We will not practice on December 22nd or December 29th. We will resume practice on Wednesday, January 5, 2011. We wish you a very good Christmas and a wonderful year in 2011. God bless each of you for your prayers and support during the year for our children at Zion. Chaplain Ramsey Mannon, from the Sheriff’s Department, presented a very interesting program to the thirty-seven folks at our November meeting. He shared many helpful safety tips for both at home and while shopping during the holidays – and the year around. Always be aware of your surroundings! The Thanksgiving meal prepared by Charlie & Melinda Heidt, Cheryl Pannal, and Judy Harmon was delicious. Thank you to them and everyone else who brought food to share and/or helped clean up afterwards. Our next meeting will be on Wednesday, Dec. 15th, at 11:30 a.m. A Christmas meal will be provided. New toys (up to $5) will once again be collected to be given to needy children of all ages through DFCS. (The toys should not be wrapped.) If you don’t want to shop for a toy, you may bring several dollars to donate towards the purchase of toys. Bring a friend, and come on out for good food and fellowship during the holiday season. On Friday, January 14th at 6:00 PM we will have a chili cookoff contest. Come bring your best pot o’ chili and compete. Prizes for contest winners. Stay for our movie night at 7:30 pm, Toy Story 3. On Friday, January 14th at 7:30 PM will be our next movie night. We will be showing “Toy Story 3” with plenty of your favorite movie snacks. Come early and take part in the Chili Cookoff just before the movie. Come join us for another great movie night. Do you have questions about what we ELCA Lutherans believe, or why we worship the way we do? Are you interested in becoming a member of Zion? Then join Pastor Barb and other interested folks for a three-session Membership Class held December 5, 12 and 19 from 10:00 a.m. to 10:30 a.m. in the Education Building. New Members will be welcomed into the Zion faith community on December 19, during the 11:00 a.m. worship service. The Membership Class will give you an idea of who we are as a people of God, and will help you decide if you want to become an active participant in our life together here at Zion. The classes are also designed to deepen your relationship with other participants and with Pastor Barb. You are welcome to participate in the Membership Class even if you are not yet sure you wish to join Zion. Family and friends are welcome to join you as you learn about Zion. If you would like to participate, or have any questions, please speak with Pastor Barb. Author pastorPosted on December 1, 2010 Categories eventsLeave a comment on New Membership Class Begins! Get out your favorite cookie recipe! All ladies are invited to make cookies for packaging. These “cookie tins” will be distributed to those 80 and over and those who are ill in our congregation. Bring your cookies to our packing night on Sunday, December 5th at 7:00pm. This is a great opportunity to spread some holiday cheer. Our Angel Tree project is up and running. Please check out the display in the entrance of the fellowship hall. The money raised from this project will go to Relay for Life Cancer Drive. Items for sale include candy, bread and ready to mix soup and dessert items. This is a great way to help out others and complete your holiday shopping. Remember, every female member of Zion is automatically a member of Women of the ELCA. All of you are encouraged to take part and become involved in one of our four women’s groups at Zion. Please check the Zionews calendar for the monthly meeting schedule. It’s a great opportunity to serve God and others! Get involved! 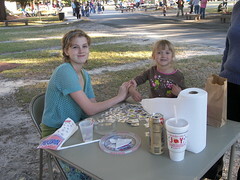 Thanks to all the youth who participated in the “Zion Fix-It Day” and those who helped with the fall festival. We also enjoyed a “Surprise Service” day as we shopped for caroling gifts. We are collecting new and gently used jackets/coats for children, youth and adults. They will be distributed to those in need in our community. There is a collection basket in the entrance of the fellowship hall. So, clean out your closets and ask your family and friends to donate too! Wednesday, December 1st 6:00pm-7:30pm: Youth Bible Study Please make plans to join us for this spiritual growth opportunity. Sunday, December 12th 6:30pm: Christmas Program All youth are encouraged to attend this year’s program. Even if you don’t have a part in the program, please plan to attend and support your fellow youth. Wednesday, December 15th 6:00pm-7:30pm: Youth Bible Study Join us for the last Bible study of the year! Sunday, December 19th 4:00pm-8:00pm: Christmas Caroling Join us as we continue a Zion tradition of caroling to our homebound members in the area. We’ll meet at the church at 4:00pm and return back to church by 6:30pm for dinner with our special invited guests (seniors 80 years and older). Bring a jacket and bring your singing voices!! Come help us as we share the joy of the season!! If you plan to attend, let Dana Lee know by Sunday, December 12th. All youth in grades 6 – 12 are invited to participate in youth activities. For additional information contact Dana Lee Smith. Life is so full of mystery. There is so much more to every thing than meets the eye! Layers upon layers of meaning lie wrapped around hidden truths that take a lifetime to unwrap. Always there are new discoveries, new information, and the things we thought we understood to day, make no sense tomorrow. And yet, we try so hard to make sense of it all! Always digging around, rooting at things, working hard to uncover the secrets of life. Counselors use the example of an onion. When you have a problem, you peel away the layers, one by one, until you get to the core of the issue that lies within, so you can heal. It takes patience and hard work. There are no shortcuts. You can’t just pick up a knife and chop at it to figure things out. Everything depends on your efforts. And, the nearer you get to the center, the more tears you shed. That model works well for things of the emotions. But, when it comes to the spiritual, I prefer to use the example of a rose. A rose, like an onion, has many layers. But, unlike the onion, you can’t peel away at it. There is nothing we need do or can do with a rose, but allow it to unfold as it will. How it reveals itself is a mystery. You can’t hurry the process, or you end up ruining it. Everything depends on the rose itself. And the lovely bloom you enjoy in the end comes to you as a gift – not something you have sweated over or cried over. There is nothing we need do or can do with this Holy Mystery called God, but sit quietly and allow the mystery to unfold as it will. God reveals God’s self to us, a little more each year. We can’t hurry God along. If we try, we end up ruining it. Christmas, for those who believe, is a time when we sit, empty hands uplifted, waiting to receive anew the most perfect gift – the most lovely bloom – the one perfect rose that is God’s great love gift to us all – Jesus Christ, our Lord. How different this is from how the world celebrates Christmas! Come in from the cold. Come into the church. Come into the place where you can retreat from the hectic schedules, impossibly long lists of things to do, the urgent appeals to “Buy! Buy! Buy!” Spend this Christmas in joyful appreciation of the Holy Mystery. Come watch God’s everlasting love for you unfold.